Reveals over forty BREATHTAKING VIEWS OF CALIFORNIA, including places like San Francisco, Yosemite, Los Angeles, Death Valley, San Diego and more. Feel like your are on vacation each time your screensaver kicks in. 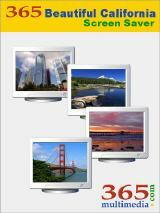 Visit California while at home or at the office and explore its BEAUTIFUL LANDSCAPES AND CITYSCAPES. This scenic screensaver reveals over forty BREATHTAKING VIEWS OF CALIFORNIA. Paint Express - Paint Express is a powerful and easy to use application designed to create, load, save, edit and print images. PhotoPrint - Create and print large pictures and photos catalogues, make large graphics collections management easily. Easy Icon Maker - Design your own professional icons quickly and easily.